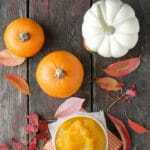 Fall and winter are a perfect time of year for making homemade Pumpkin Puree with the abundance of winter squash available. The method is simple and easy, as well as the puree freezes wonderfully for later use. The yield is highly dependent on the pumpkin's size and its meatiness. As a guide, I recently made puree using a seven inch diameter pumpkin whose flesh walls were about 3/4-inch thick which yielded 3 cups.